IPL 2019: Imran Tahir also got the Kolkata captain Dinesh Karthik. IPL 2019: MS Dhoni was faster than broadband internet! 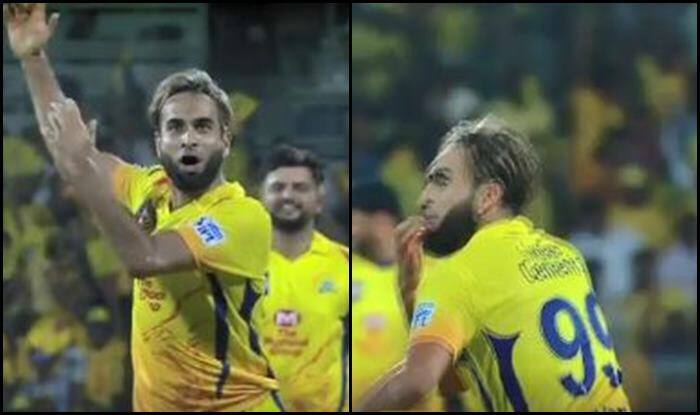 Yes, Dhoni did what he does best, but Imran Tahir stole the show with his new celebration. Known to have strange celebrations after picking a wicket, Tahir took it to another level when Dhoni stumped Gill for nine runs. It was the googly from Tahir with the deception that foxed Gill, who went searching for the drive away from his body without reading it at all. It beats his inside edge and overbalances himself by dragging his back leg out of his crease. MSD was quick to spot it and whips the bails off in a flash. No need to go upstairs as well. CSK all over KKR like a rash. Meanwhile, CSK won the toss and opted to bowl first. CSK got off to a dream start as they got wickets in plenty. CSK picked up four KKR wickets inside the first powerplay. Chahar was the pick of the bowlers with three wickets to his name, as Imran Tahir and Harbhajan Singh picked up two wickets apiece. At the time of filing the copy, KKR was 76/7 in 15.3 overs. Russell is the last hope for KKR, he is on 21*. KKR are table-toppers and such a batting show was not expected of them, but that is how the game of cricket is, it is a great leveler.